A TRULY DECEPTIVE, two bedroom detached bungalow, situated in a sought after VILLAGE LOCATION with SUPERB PANORAMIC COUNTRY VIEWS to the rear. The bungalow has been EXTENDED and has the further benefits of oil central heating, DOUBLE GLAZING, RE-FITTED KITCHEN, garage and LARGE REAR GARDEN. 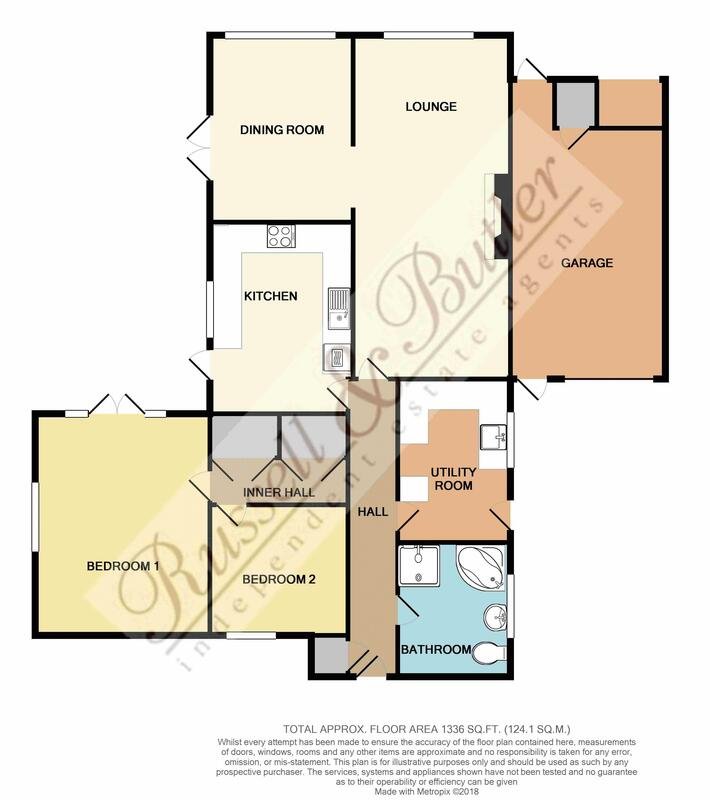 The accommodation comprises: Entrance hall, Inner hall, lounge, dining room, kitchen, utility room, two bedrooms, bathroom, garage and rear garden. NO ONWARD CHAIN. EPC D. Entrance Upvc double glazed entrance door to: Entrance Hall Wood laminate flooring, built in storage cupboard, access to loft space, Blue Chip alarm system, central heating thermostat, radiator. Bathroom 7' 9'' x 9' 3'' (2.36m x 2.83m) White suite of corner bath, double width fully tiled shower cubicle, pedestal wash hand basin, low flush wc, full ceramic tiling to all walls, ladder towel radiator, ceramic tiled floor, Upvc double glazed window to side aspect. Lounge 24' 0'' x 11' 3'' (7.32m x 3.44m) Brick built fireplace with LPG fire, wood laminate flooring, double panel radiator, Upvc double glazed window to rear aspect, archway to: Dining Room 13' 1'' x 9' 5'' (4.0m x 2.88m) Wood laminate flooring, large Upvc double glazed picture window too rear aspect, Upvc double glazed French patio doors to rear garden, double radiator. Kitchen 13' 5'' x 10' 0'' (4.09m x 3.06m) Fitted to comprise inset single drainer stainless steel sink unit with mono block mixer tap and cupboard under, further range of base and eye level units, rolled edge work surfaces, ceramic tiling to splash areas, four ring ceramic hob with extractor hood over, split level electric double oven and grill, glass serving hatch through to dining room, plumbing for dish washer, ceramic tiled floor, Upvc double glazed door and window to rear garden. Utility Room 11' 5'' x 7' 10'' (3.48m x 2.40m) Fitted to comprise Belfast sink with mono block mixer tap and cupboard under, further range of base and eye level units, rolled edge work surfaces, ceramic tiled splash areas, space and plumbing for automatic washing, space for tumble dryer and freezer, radiator, Upvc double glazed window and door leading to the driveway. Inner Hall Double width airing cupboard housing hot water tank and immersion heater with hanging rail, double fitted cupboard with hanging rail, wood laminate flooring. Bedroom One 14' 2'' x 12' 2'' (4.32m x 3.72m) Fitted wardrobes with matching chest of drawers, double radiator, Upvc double glazed window to side aspect, Upvc double glazed French patio doors to rear garden which look out superb views. Bedroom Two 9' 1'' x 10' 2'' (2.78m x 3.09m) Fitted wardrobes with hanging rails and shelves, radiator, Upvc double glazed window to front aspect. Front Aspect Driveway to single garage, path to property entrance, personal door to side, outside tap, outside light, security light by the garage. Rear Garden A southerly facing large rear garden with panoramic views over open countryside, laid mainly to lawn, with 'L' shaped flower and shrub beds, enclosed by hedging, good sized decked patio, out side tap, out side lighting. Garage 17' 6'' x 10' 10'' (5.34m x 3.30m) Single garage with up and over door, power and light connected, personal door to front and rear, cupboard housing "Worcester" oil fired boiler serving central heating and domestic hot water, oil storage tank to rear of the garage. Wood laminate flooring, built in storage cupboard, access to loft space, Blue Chip alarm system, central heating thermostat, radiator. White suite of corner bath, double width fully tiled shower cubicle, pedestal wash hand basin, low flush wc, full ceramic tiling to all walls, ladder towel radiator, ceramic tiled floor, Upvc double glazed window to side aspect. Wood laminate flooring, large Upvc double glazed picture window too rear aspect, Upvc double glazed French patio doors to rear garden, double radiator. Fitted to comprise inset single drainer stainless steel sink unit with mono block mixer tap and cupboard under, further range of base and eye level units, rolled edge work surfaces, ceramic tiling to splash areas, four ring ceramic hob with extractor hood over, split level electric double oven and grill, plumbing for dish washer, ceramic tiled floor, glass serving hatch through to dining room, Upvc double glazed door and window to rear garden. Double width airing cupboard housing hot water tank and immersion heater with hanging rail, double fitted cupboard with hanging rail, wood laminate flooring. Fitted wardrobes with matching chest of drawers, double radiator, Upvc double glazed window to side aspect, Upvc double glazed French patio doors to rear garden which look out superb views. Fitted wardrobes with hanging rails and shelves, radiator, Upvc double glazed window to front aspect. Driveway to single garage, path to property entrance, personal door to side, outside tap, outside light, security light by the garage. A southerly facing large rear garden with panoramic views over open countryside, laid mainly to lawn, with 'L' shaped flower and shrub beds, enclosed by hedging, good sized decked patio, out side tap, out side lighting. Single garage with up and over door, power and light connected, personal door to front and rear, cupboard housing "Worcester" oil fired boiler serving central heating and domestic hot water, oil storage tank to rear of the garage. All main services connected with the exception of gas. Council Tax Band E. EPC Rating TBC.